Outboard Engine Stand, Carriers and Outboard Engine Trolley in galvanized, stainless steel and aluminium to carry all outboards up to 150hp, ideal for working on or transporting your boat engine. Also Ideal For Winter Storage Of Your Outboard Engine, Now supplying the Motoflex Outboard Engine Support Pole to prevent boat transom strain when transporting on a boat trailer. Outboard engine stands, carriers and outboard engine trolley in galvanized, stainless steel and aluminium to carry all outboard engines up to 150hp, ideal for working on or transporting your boat engine. Now supplying the motoflex outboard engine support pole to prevent boat transom strain when transporting on a boat trailer. Quality outboard motor trolleys. 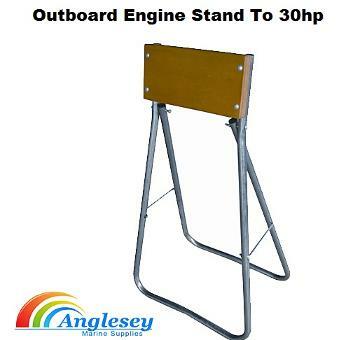 Superb quality Galvanized Outboard engine stand manufactured from strong galvanized steel, folds flat when not in use, fitted with a pre treated timber mount. The outboard engine stand is of a very strong construction and is perfect for winter storing or working on your outboard engine. 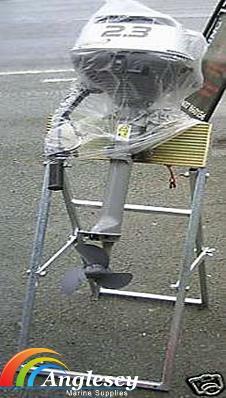 Light duty outboard engine stand. Easy to set up and use yet durable enough to take boat engines up to 30hp. Ideal stand for working on your outboard motor when not in use. 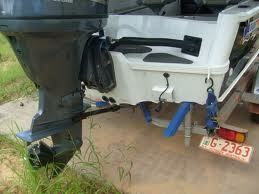 A very cost effective outboard engine stand. 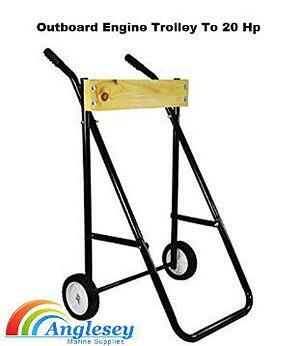 Lightweight Outboard engine Trolley, Outboard motor trolley to suit small lightweight boat outboards up to 20HP. 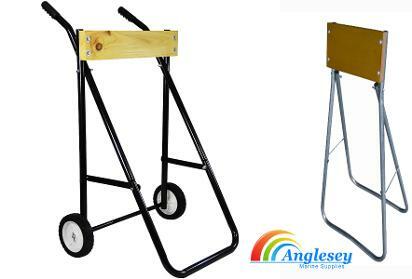 The outboard trolley is collapsible and made from 22mm steel frame and 12mm plated axles. 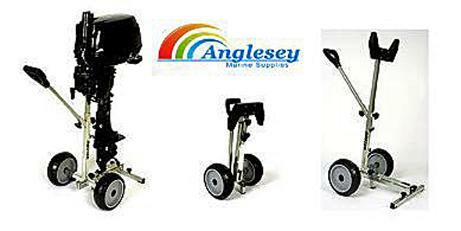 Designed to make the job of moving lighter outboard motors a lot easier. Fitted with pneumatic trolley wheels. A quality outboard motor trolley. 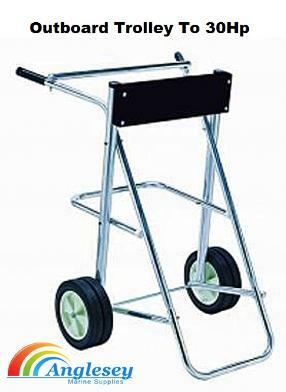 Outboard Motor Trolley Stand motor carrier to carry outboards up to 130lb in weight boat outboard engines. 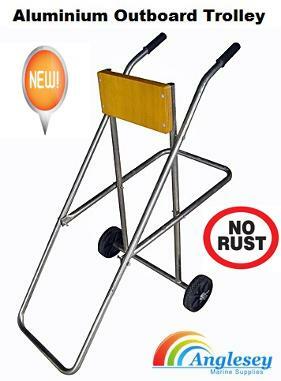 The outboard motor trolley Utilizes tough 1" alloy reinforced tubing. 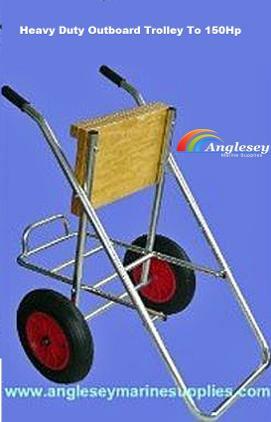 Pneumatic 4 - 2.50 rubber tyred wheels, mounted on a sturdy 12mm steel axle.The outboard motor trolley folds for storage. 94cms. A very cost effective outboard trolley. 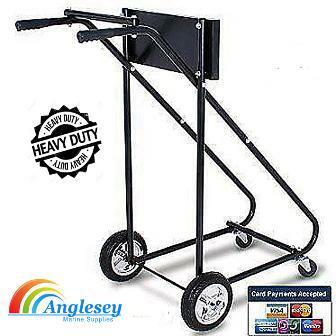 Heavy duty outboard Engine Trolley motor carrier. The heavy duty outboard engine trolley will carry outboard engine between 40-150hp. Built from 30mm tubing. 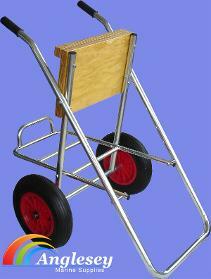 The heavy duty outboard engine trolley uses pneumatic tyres. Heavy duty outboard Engine motor trolley with castors wheels, will carry large outboard engines up to 138 kilos in weight. Uses 32mm and 25mm tubing. Fitted with 4 x 2.50 pneumatic wheels and 3" swivel wheels. A new outboard engine trolley for 2019. Folding outboard engine trolley. Easy to handle and folds away when not in use. Made from heavy duty plated steel and rides on pneumatic wheels. Also weights less than 6 kilos but can carry outboard engines up to 15hp. Quality aluminium outboard engine trolley, new on the market, no more rust or corrosion with our aluminium outboard engine trolley. Very easy to handle, really lightweight. The aluminium outboard engine trolley will carry outboard engines up to 85lb in weight. Outboard Engine Trailer support bar designed to take the weight of the outboard engine when the boat is on the trailer on being transported, eliminate bounce and strain on the transom. Will support all outboards up to 150hp.